This article by Saha Pasulka is an awesome, well informed, educational rant about the need for startups to use marketers and implement smart marketing strategies if they want to succeed as a business. It has some similarities to my rant this morning about the role of design in tech startups. Are we (non-developers/engineer types) bitter or do we just want to help? For me it's about only putting good stuff out as a baseline then there is our legacy. I'm invested and passionate about the legacy and impact of this time in history. I want us as a tech/creative community to get together and do the best work possible and not be remembered as the generation that didn't quite do it. So Instagram came out with new policies that are making everyone freak out. Some people are leaving the platform and news outlets are making statements like this. This statement highlights something that is really really bugging me. Our online communities seem to hold zero acknowledged value within society and there for are continually falling victim to both the unregulated policy shifts of platform owners and the flippant disregard of the media. Dark Pattern: Now you see it. Now you don't. Here's how it goes. You decide to be a Budweiser bottle for Halloween. You think, "I should really get into the head of Budweiser. Really study up on the brand voice, observe it's customers, dive deep into the underworld of Bud." 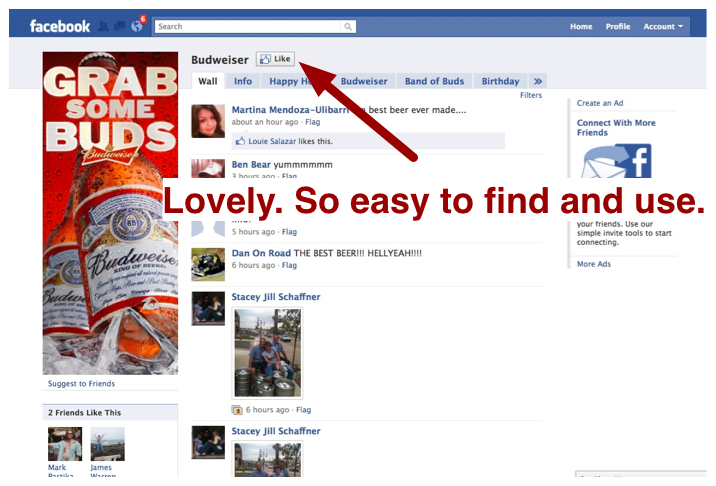 So you "Like" Budweiser on Facebook. Fast forward to mid-November. Your costume was a success.You were even able to keep perfect beads of condensation flowing down your neck all night and still get a few phone numbers from girls that "don't really drink beer" but might make an exception for you. That was fun. Continuing to get marketing messaging for a beer you don't even drink in your Facebook stream, not so fun. So you bop over to the page and look for the "Unlike" button. It takes you 5 mins of looking around. You didn't find it where it was when you "Liked" it. You look on your profile. You look in your settings. Nothing! You go back to the page and carefully walk your eyes down every piece of text on the page and finally there it is, right next to "Create a Page for My Business" What?!? Why? You've just been victim of a Dark Pattern. Site designers place the functionality or information they want you to find front and center, then move it once you have completed the desirable behavior so you are less likely to undo said desirable behavior or re-find information that does not support the business's plans for you. Now I get that it would be unsavory to have a big "Unlike" button at the top of the page but may I suggest a couple palatable solutions. 1. Provide an "Unlike" button for each item in my Like list. As you can see the one place where you can find a full list of your Likes has no management capabilities. 2. Add the Unlike button or link to the group of other functions available on the page. This just makes sense. I could be wrong maybe this was just an oversight, but I don't think so. 1. Users lose confidence in themselves. Most people will blame themselves for the inability to complete a task on-line. When people feel less confident, they stop trying to learn and we need users to grow with us so we can continue to grow the web. 2. We lose the trust of users. If users consistently feel they are being tricked and don't understand, they will become more selective about what they do and how quickly they will do it. This makes our jobs a lot harder. 3. The site metrics are skewed. Good data is only as good as the data its self. If I've got 2k people that "Like" me only because they can't figure out how to not "Like" me, the metrics of the entire program are thrown off. I haven't done much thinking about Twitter lists yet, but I did stumble upon this very elegant and smart way to use them. I like that the lists are completely relevant to the profile and answer questions you would like the answer to. While we are highlighting the smartness of Work [at] Play...you must check out their site. I love how the background (image of them working) is supporting and standing behind the work (it pops over the background) nice little metaphor. I'm also really into the horizontal movement when you navigate. There are many ways to engage your users, one of these ways is to allow them to register their opinion in a quick and simple way. This trend is a nice way to engage the majority of people will never actually construct a written comment or craft any other type of content. It's the "low barrier to entry" User Generated Content (UGC). You often see this done with a nice set of buttons that range from approval to disapproval depending on the social environment of the application. Facebook for example only allows you to "Like" something, which is perfectly appropriate, as there is no sense in giving people tools to be mean spirited with. A person can do plenty of damage with the current set of features. Although, it would be nice to have a range of "nice" or constructive" opinions you could register via a simple button. One thing to remember when designing this type of User Generated Opinion (UGO) functionality is that you must have a scalable plan. The plan needs to consider the effect of these opinions at project launch and a year later. It needs to envision how will they impact the experience when you have 100 participates, 1000 participates or tens of thousands. How can these ratings establish and maintain value, usefulness and creditability over time? TIME: Are the responses permanently attached to the content or only available for a limited amount of time? REACH: Where are they visible? Who will be able to see them and is this a good thing? INTENDED INFLUENCE: Are they meant to influence a user's decision making process or just promote conversation between a small group of people? It maybe true that Matt Hermann dislikes many cars but is this The Matt Hermann Personal Rant website? Is this the brand experience Honk would like to project in the first months of the project being live? Just because you ask users to participate doesn't mean you have to allow this participation to rule your site. It's also more than likely that your users are trusting you to manage the participation in a way that is benifitcial for everyone. I doubt Matt realize he was going to be presented in such a way on the site. He is an early participate and was "rewarded" for this by being plastered on the front page in all his critical glory. He'll probalby think twice about participating again. I know I would. I read Josh Bernoff's article How to create a social application for life sciences without getting fired a while back and I found myself thinking about it again this weekend. I think the above chart is excellent and the perfect tool for illustrating how social media tools may or may not be appropriate, beneficial or wanted by different users. You know that point in a project where you have the big list of ideas and have to start slimming them down. I think this chart is an excellent piece to start the meeting with, it kinda greases the mind into thinking in a critical way about real people, their needs and current habits. Yes, those with Cancer have a lot to gain by connecting with other Cancer suffers but it's easy to see why they don't currently spend a lot of time online in these communities. Cancer treatments take a lot out of you and many people still have to continue their normal lives while under treatment. So, if we wanted to give them social tools, they would have to have high, immediate value and would need to be embedded into a process they already participate in or really really easy with a low barrier of entry. Josh actually created this chart to help understand whether the risks involved with implementing social tools in the health care industry had strong enough value to the users to pursue. He says, "I decided to focus on who has the most to gain from social applications. Because if you don't have a lot to gain, the regulatory issues mean you may have a lot at risk, and it's not worth it"
He's right on and really asking the right questions that will ultimately protect his clients. There is also a much broader lesson in this statement that we can and should apply when working on our own projects. What risks will your brand or campaign be taking by implementing particular social tools? There may not be a large regulatory body like the FDA watching you but there is risk involved with implementing these tools. Is this something your target users even want, will use or, find benefit in? If no, why would you expose the company to the obvious complications, risks, and at very least management responsibliites of emplimenting a social media tool? How will your users react to the new functionality? Will they backlash and decided to go somewhere else? Will they be irritated and loose trust in the brand? or will you fullfill all thier dreams? I will hope it's the later but I know doing research and analisys such as this will get you a lot closer than you might have been. I tweeted about this new project a few weeks back but wanted to mention it here. One because it's a wonderful idea and I'm really excited to follow it's progress and two because one of the organizations you can volunteer for is the Brooklyn Museum. I wrote about their innovative community tagging program and it seems they are taking it further by soliciting tags from The Exraordinaries volunteers. Love it. As for this whole idea of getting people to use their phones and little free time to do something good.....I also love it. I think if they can capture the spirit of playing a game it will really take off. Tons of people spend tons of hours playing little games on their phones, if you could play a "game" and do good, wouldn't that be great. It isn't really into the game realm yet but the potential is there. There are quit a few community tagging/cataloging projects. What do you librarians think of this? This one is pretty neat. Building a catalog of places for kids to play.